Dimensions 1.50 by 6 by 9 in. 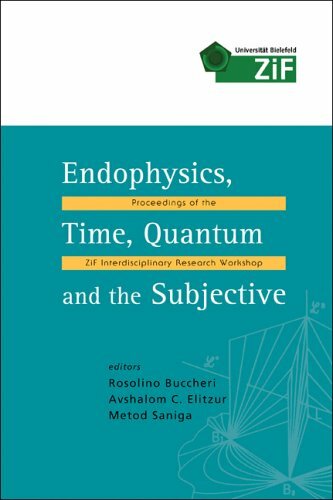 Amazon.com description: Product Description: Endophysics, Time, Quantum and the Subjective is the first systematic cross- and trans-disciplinary appraisal of the endophysical paradigm and its possible role in our understanding of Nature. Focusing on three of the most pressing issues of contemporary science, the interpretation of quantum theory, the nature of time, and the problem of consciousness, it provides the reader with some forefront research, concepts and ideas in these areas, such as incessant Big Bang, geometrizing of "mental space-times," and a contextual view of quantum mechanics and/or a view of the Universe as a self-evolving quantum automaton. Although primarily aimed at academics this engaging volume can be read by anyone interested in modern physics, philosophy, psychology and cognitive sciences. About: Endophysics, Time, Quantum and the Subjective is the first systematic cross- and trans-disciplinary appraisal of the endophysical paradigm and its possible role in our understanding of Nature.